Philadelphia will be playing host to a day completely devoted to a versatile protein that puts a new meaning to the slow food movement. The city will be hosting National Escargot Day, which means participating restaurants will be plating more than 30,000 Wild Burgundy snails, or more than 600 pounds, according to organizer and self-professed snailman, Douglas Dussault. This is the fourth year Philadelphia will be hosting the event. It previously hosted in 2007, 2011 and 2012. It’s grown from just one restaurant, Le Bec-Fin, to 30 this year, including Noord eetcafe, Laurel, Bibou and Vetri. The national day gives restaurants the excuse to “roll the dice” and be creative with their dishes, Dussault said. With so many spots offering snails on their menus, it shows restaurateurs are realizing people in the city “really like escargot,” Dussault said. DOES ANY foodstuff carry as much baggage for Americans as escargot or foie gras? When it comes to escargot, it can be hard to move beyond the old pop-cultural image of snail as “snob food.” Plus, for many newbies, there’s a primal, knee-jerk repulsion to the animal itself or to the presentation that, when done badly, can look like boogers. And when it come to foie gras — the third rail of the food world — it’s difficult to steer any discussion of fatty duck or goose liver away from the ethical or political and back toward the culinary. The fact is, you can’t open a French restaurant and not have both on the menu. Of course, bringing up the French immediately means a certain strain of “Amurican” gets his back up. 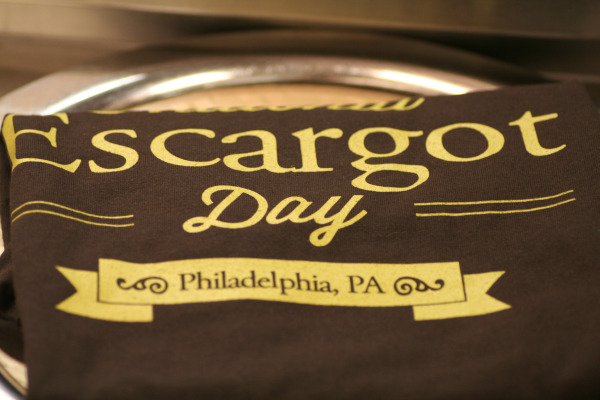 I began thinking about the cultural significance of snails this week, because Thursday is National Escargot Day, which will be marked by special menus at numerous restaurants in Philadelphia. I love escargot. I mean, what’s not to love? When done well — meaning plump and meaty rather than shriveled and boogerish — it becomes a deliciously textured delivery vehicle for bubbling butter and garlic and herbs. But I realize that, for some, snails still represent a dividing line that they will not cross. It’s a shame. If this describes you, why not take the opportunity to try escargot this week? Come on, it won’t kill ya. National Escargot Day was the brainchild of Doug “The Snailman” Dussault, whose company Potironne is the prime importer of wild Burgundy snails from Henri Maire, considered by many to be the best snail purveyor in the world. The snails are gathered by hand, then poached in a classic court-bouillon before being packaged and shipped. Lately, the snail business has been great for the Snailman, with March being his best month since he began importing wild snails in 1999. At that time, Dussault had just finished cooking school at Le Cordon Bleu in Paris and had been working at the famed French restaurant Taillevent. 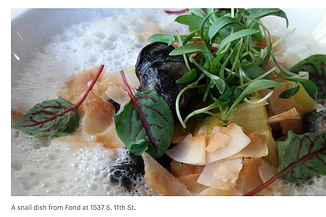 “The only thing that came into the kitchen in a can were these wild Burgundy snails,” he said. When he returned home, Dussault started Potironne and became the American importer of snails from that company. He found immediate demand from high-profile French chefs in the U.S.
Daniel Boulud in New York was his first customer. While there may be an increase of love for snails, there’s been a growing backlash against the other French bistro staple, foie gras. Animal-rights activists deplore what they call the “force feeding” of ducks and geese and have lobbied to ban the food in many cities and states. 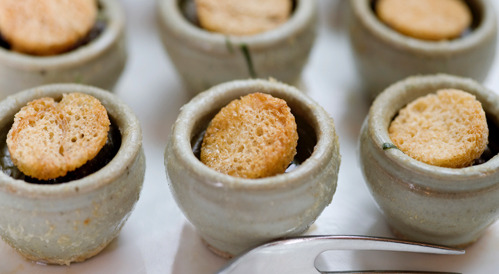 On July 1, California will be the first state with a law banning foie gras. More than 100 of California’s highest-profile chefs have petitioned the state assembly to reconsider the ban. To buy wild Burgundy snails online, and for recipes: potironne.com.